Michelle is a USDA-NIFA Postdoctoral Fellow and a Science Policy Fellow with the Entomological Society of America. 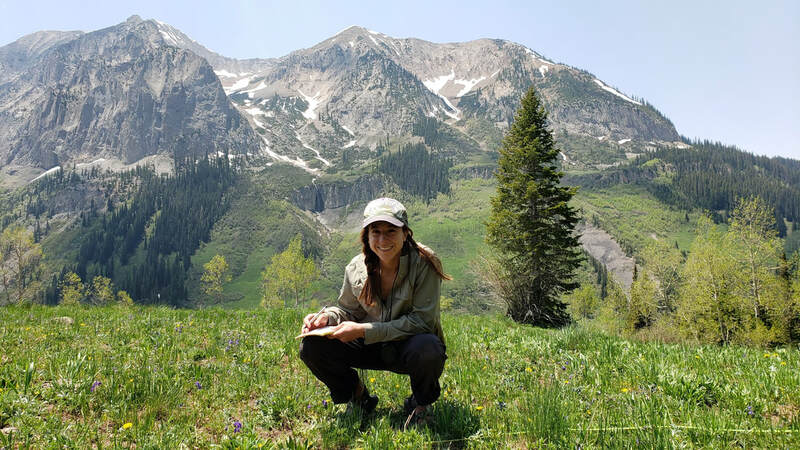 In the Woodard lab, she is studying the nutritional ecology and conservation of wild bumble bees in the Sierra Nevada Mountains, with an emphasis on how agricultural development is impacting bee nutritional health. Her dissertation research focused on the phylogeography of a bumble bee species complex in Mesoamerica, as well as an in-depth population genetics study of the commercially managed pollinator Bombus ephippiatus in Mexico. She has also explored the evolution of color patterns within the genus Bombus ​worldwide. Kristal is an expert in native bee biology, pollination ecology, and plant-pollinator interactions. She is passionate about basic natural history of bees and plants, the application of that knowledge in understanding the pollination ecology wild ecosystems and developing management strategies within agricultural contexts, and the pairing between natural history and molecular biology. She has worked with bees for over 12 years, and has been known to coo adoringly at them from an early age. She is currently leading projects on oil-collecting bees in the desert Southwest and genomics of Arctic bumble bees. Kaleigh is a 2nd-year PhD student studying gustation in bees and the resilience of Neotropical stingless bees in the face of global change. She is broadly interested in plant-pollinator interactions across natural and managed systems, including how varying levels of agricultural intensification influence pollinator foraging behavior and population and community dynamics. Stingless bees (tribe Meliponini) are social honey bees in the tropics that are important for their pollination services and honey production. For her PhD, Kaleigh will be exploring how resource fluctuations and the dynamics of pollen, nectar, and resin influence foraging behavior in this group of bees, in order to better understand behavioral, physiological, and sociobiological patterns across varying gradients of agriculture. Natalie is a 1st-year PhD student studying how nutrition impacts bumble bee physiology and behavior. She is currently leading project on bumble bee buzz pollination and pollen foraging in Arctic bumble bees and her PhD research will focus on the energetics of buzz pollination. Natalie has broad interests in physiology, behavior, and ecology, and is particularly interested in applying computational approaches to the study of bee behavior. Erica is a first year PhD student broadly interested in social evolution, plant-pollinator interactions, and insect behavior. She is currently studying the behavioral plasticity of early nesting queen bumble bees, with an emphasis on understanding how foraging mechanics, environmental sensitivity, and selective pressures vary among the solitary and social phases of the bumble bee life cycle. Alex is a 4th year student that transferred to UCR from San Bernardino Valley College in 2016. Originally a Biology major, she switched to Entomology when she applied to UCR because of her career goals of becoming a forensic scientist and/or forensic entomologist. Though she is new to the world of insects, the social interactions of bees truly fascinate her and attracted her to the Woodard lab. She is especially interested in examining mechanistic relationships between social behavior and physiology. Stephanie is a 2nd year student majoring in Biochemistry at Fullerton Community College. Broadly speaking, she is fascinated in the evolutionary pressures that drive the formation of the complex and beautiful forms of organisms. Specifically, she is interested in studying coevolution between plants and insects, and how bees diversified in their morphology and sociality. Christie is a Biology major at Chaffey College who joined the Woodard lab as a participant in the NSF-funded Computational Entomology REU Program at UCR. She has broad interests in entomology and has traveled to Alaska to collect and is currently examining how body size influences pollination performance in bumble bee workers. She plans to transfer to UCR as an entomology major after completing her Associates degree, and ultimately wants to pursue an advanced career as an entomologist, with her specific research focus to be determined. Phong is a 4th year student of Entomology. While taking an Aquatic Insect course, he realized that he had to major in Entomology after finding himself endlessly sharing insect facts with his non-entomology friends. Now, he is happily immersed in the field in Dr. Woodard's lab, where he works primarily with postdoc Michelle Duennes on brain gene expression in bumble bees (focusing on brain dissections). From 30 minutes down to 6, Phong aims to achieve his goal of dissecting a brain within 5 minutes before graduating from UCR. Alex is a 1st year undergraduate student majoring in Biology, and he is passionate about research and pursuing a career in both medicine and biomedical research. His research in the Woodard lab primarily focuses on the growth and development of cultures of bees from a larval state onward. Alex is interested in studying and developing new methods that ultimately help us to better preserve bees and understand social dynamics within colonies. Gina is a second year undergraduate student majoring in Biochemistry who joined the Woodard Lab as a PERSIST/RISE pupil. She is interested in the biomedical sciences as well as behavioral research. Within the lab, she is working with PhD student Kaleigh Fisher to explore the social dynamics of young and small bumble bee nests. She intends to use that knowledge to gain an understanding of the species specific differences of these bees, to further the preservation of these important insects. Damaris is a first-year undergraduate Honors student majoring in Biology. She wants to pursue a career in the medical field but is still very interested in research and wants to make significant contributions to the scientific community. She is extremely passionate about the environment, and acknowledges that bees are an essential part of global sustainability. She intends to use this passion to understand the role that bees play on earth, their anatomy, and what we can do to protect these little critters. Fernanda is a 3rd-year Biochemistry major and an Honors student, CNAS Science Ambassador, and Vice President of the Transfer Outreach and Beyond here at UCR. Her ultimate goal is to attend medical school and/or earn a PhD in biology, and in her research in the lab she is primarily interested in learning if there are adverse effects posed global change that inhibit the ability of bumble bees to buzz pollinate effectively. She is passionate about helping people and animals all around, especially bees (! ), and about outreach to engage with and recruit local community college students to UCR. Hadeel is a 3rd-year transfer student from Riverside City College, majoring in Biochemistry. She is a member of UCR's STEM Connection Program and President of Transfer Outreach and Beyond, where she helps other students transfer and transition to 4-year institutes. Her original career goal was to become a pediatrician, but she is also considering a PhD in biochemistry. Her interest in entomology was discovered during the STEM Connections Winter trip, where she joined the Woodard Lab in fieldwork and learned more about the social and ecological impacts bees have on the environment, and now she will be researching the social impacts worker bumble bees have on the queen, among other topics. Any of her free time is happily spent at Disneyland, where she can thinly cover up her anxiety about upcoming exams with churros and Dole whip.